Between 1992-96 I attended the music and folk music major at the College of Nyíregyháza. Since then I have been teaching fourteen hurdy-gurdy pupils every Monday and Wednesday at the Music School of Pomáz. In spite of the fact that it has been possible for almost 30 years to learn to play the hurdy-gurdy in Hungary institutionally, we still owe the enquirers a good course book. Although we have already written the curriculum at least. The framework curriculum for elementary art schools consisting of 6+4 grades was worked out by myself, while the one for secondary schools was written by Pál Havasréti. With this we achieved that playing the instrument can be taught in the country uniformly. My pupils at the Music School of Pomáz are mostly children and young people between 6-20 years of age, but sometimes oldert enquirers and foreigners pop up as well. It was partly because of them that we decided to hold meetings at weekends and vocational camps in summer regularly. 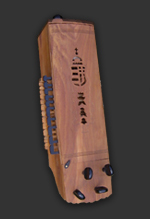 Nowadays hurdy-gurdy festivals and camps are organised five times a year. This season starts at the first weekend of May in Pomáz with the Nation-wide Hurdy-gurdy Festival. Several music schools and workshops are to be introduced here, and the contest of hurdy-gurdy soloists is has also become a custom. For the evening concerts we aim at inviting famous bands. The second happening of this year is to be held in Szentes, the „ancient home” of the hurdy-gurdy. It is also in Szentes, at the riverside, where the summer camp is to be held at the end of July. Here, beside the intensive learning, it is possible to relax in a really beautiful environment. In the last week of August a joint camp is to be held with bagpipers. From a vocational aspect this is important, because there are a lot of similarities in the playing methods of different bourbon instruments (bagpipe, hurdy-gurdy, zither), moreover, these instruments preserve the ancient state of our traditional music, from before the usage of the strings. The fourth event is for living tradition: every year around St. Michael’s Day we pass some time in Tiszaalpár, the home village of Mihály Bársony. Here we husk the corn together with the preservers of this tradition, by the end of the husking bee the good mutton-supper is ready, then comes the husking ball with hurdy-gurdy music. On the following day (Sunday) we celebrate together in the church at the hurdy-gurdy mass. We are closing the year in Keszthely, thanks to the Család Iskola (Family School). As for the Keszey family, it is only their commitment towards the hurdy-gurdy that is stronger than their hospitality. It is the best moment of the year when we still the St. Andrews’ Day’s Ball with singing together, playing the hurdy-gurdy and lighting candles, and then we start Advent together. Beside teaching at the music school I regularly meet children at kindergarten. With my sister, Andrea Szerényi Gundyné, who is a nursery school educator, we have dealt with the children at kindergartens every week for many years in Budapest in the II. district in Fajd Street and Fillér Street. The process and the pedagogical methods of these activities for living music was worked out by my sister, and we gladly present them in other kindergartens, schools, or other children groups. Beside all these, I regularly give lectures about folk music and instrument making at secondary and higher educational institutions.